As the weather warms up, I’m itching to start growing again and it’s tempting to start as soon as possible but there are good reasons for sowing a bit later in the year. I’m going to focus on sowing under cover, as this is the method I use for the majority of my annual flower seed. The other option is direct sowing where you sow straight into the soil outside but you must wait for the soil to warm up for this. Sowing under cover means that you gain a head-start and will get earlier flowers. You don't need a greenhouse or potting shed for this. I use my windowsills and using 2 windowsills, I have space for all the annuals that I grow. By having my seedlings in the house, I can keep an eye on them so that I don't forget to water them and turn the pots each day. You can also protect your seedlings from being munched by slugs and other pests, until they are larger - larger plants are more able to withstand a bit of nibbling. A. When it comes to sowing, day-length is more important than warmth. If you sow too early, your seedlings are likely to become leggy from straining for the light by the time you plant them out. The first thing to do is to split the annuals you want to grow into hardy* and half-hardy** types to simplify things. Then, sow all the hardy seed from early - mid March and all the half-hardy ones from early April. You can also sow at any time throughout the spring and summer so if you miss sowing in March and April, you can still have flowers this season, they’ll just appear later. As long as there is time for them to grow and flower before the first frost, you can sow annuals at any time. 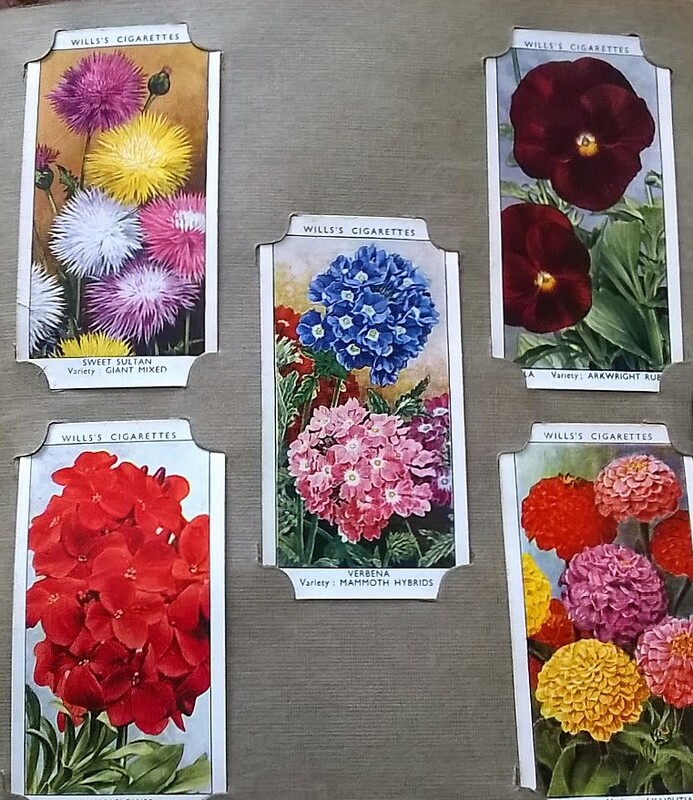 I sow a 2nd batch of hardy annuals when my first batch start flowering, so that once the first batch have flowered for 2-3 months, I have plants to replace them with. Using this method, I have a continual supply of flowers from late May until the first frosts. *Hardy annuals are just that, hardy - meaning that they’ll survive winter cold and wet and withstand a frost. **Half-hardy annuals cannot withstand frosts and so need to be planted out after all risk of a frost has passed. This is generally mid-late May in this area, so if I sow at the beginning of April, I know that my plants will be the perfect size for planting out when the warmer weather arrives. Hardy annuals can also be sown in late August - October for early flowering the following year. They go into a semi-dormant state through the winter, coming into growth again in the spring. 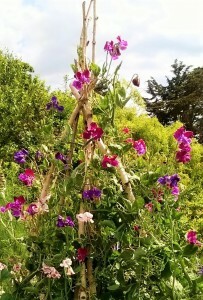 Sweet peas, Cornflowers and Ammi all do well with this method. Q. Do I need special seed compost? A. Seed compost is specially formulated for growing seeds but for me, a good multi-purpose compost is less expensive and performs just as well. Trials have shown that multi-purpose can be really good and the good ones had less peat than the top rated seed compost in a recent Which? trial. Peat-free options generally performed less well but they are being improved all the time. Whichever compost you use, break up any large lumps and fill your seed trays or pots loosely to the top before firming it down gently – the bottom of another tray/pot can be used to press it down. Leave a small gap at the top for watering. Q. How deep do I sow the seed? A. 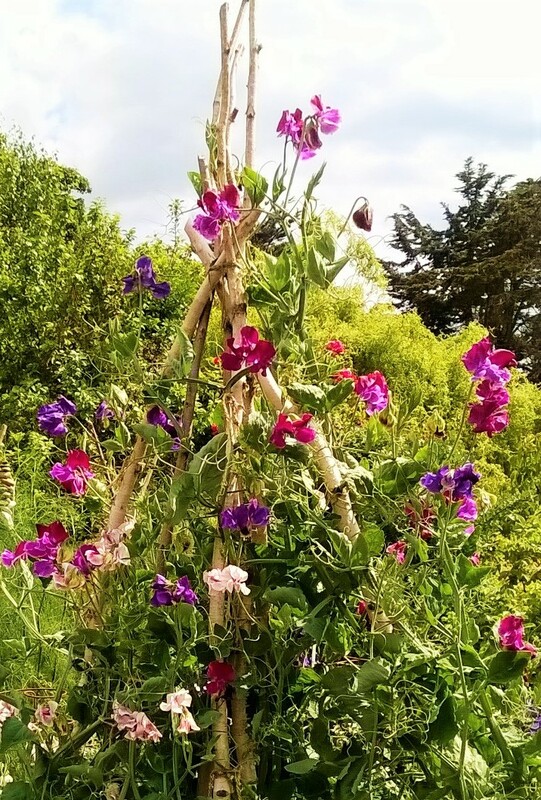 Seeds vary in size, generally, larger ones like sweet peas should be buried under about an inch of compost and smaller ones just need a fine sprinkling of compost over the top. Very fine ones like poppies can be left on the surface. Q. Should I use trays or pots? A. Seed trays can be useful for small seeds where you want to sow a lot of one type of seed. However, I find that I don't want to grow more than 3 or 4 of each type of annual in my cutting beds so to make things as simple as possible, I sow all my seed directly into square black plastic 9cm pots. This is the ideal size to house seedlings for up to 6-8 weeks, without getting root-bound, which is a good size for planting out and prevents the time-consuming need to prick them out and pot them on. I plant 2-3 seeds per pot (or a small pinch of very tiny seeds) and pull out all but the strongest seedling once they emerge). 8 of this size pot fits nicely into a square seed tray that acts as a reservoir for water. The tray fits perfectly on to my windowsills and means the whole tray can be easily turned every day to prevent seedlings growing towards the light. I also happen to collect large numbers of this size of pot as it’s a popular size for garden perennials to be housed in when you buy them from the garden centre. 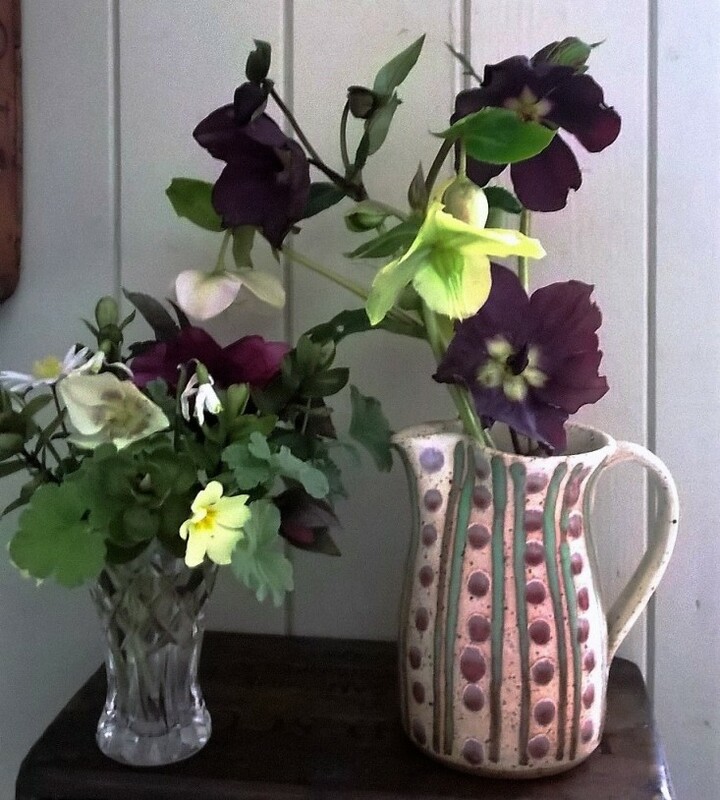 At Miles Garden Design, we are left with lots of this size pot left at the end of a planting job so, for me, they are essentially free - lucky me! You may be able to get them for free on sites like Freecycle or you can buy them fairly cheaply on the internet. You can re-use them, making sure that you clean them thoroughly at the end of each year. Q. How often should I water my seedlings? A. Water the compost well before you sow the seeds, rather than after sowing, so that you don’t dislodge the seeds or wash off the covering of soil. Check pots daily and water sparingly with tepid tap water. Don't use water from a rain barrel as it may harbour diseases and small seedlings are vulnerable. Use a small watering can with a fine rose. Keep pots moist but not wet. Labeling. Label all your individual pots or seed trays as it is very easy to lose track of what you have sown. I use sturdy multi-coloured plant labels and use a black wax pencil to mark them. At the end of the season, you can scrub off the writing with a sponge scourer and some washing up liquid and re-use them. I like using coloured ones as you can use a different colour for different plants in each tray so you can immediately see how many of each type you have. Plus, they look pretty. Create a list, use fresh seed. Have a plan for planting up your annual cutting bed and a list, so you know exactly how many of each plant you need to sow. I generally only grow 3/4 of each type of annual and actually don’t need much seed from a packet. Spare seed can be shared with friends or stored for using the following year but do check expiry dates on packets as the germination rate does go down, the older the seed is. If you are unsure, you can perform a simple test to see if the seed is still viable. According to the Meteorological calendar, March 1st is the official start of Spring and that is good enough for me to shrug off Winter (though maybe not my layers of jumpers just yet) and embrace the new growing season. 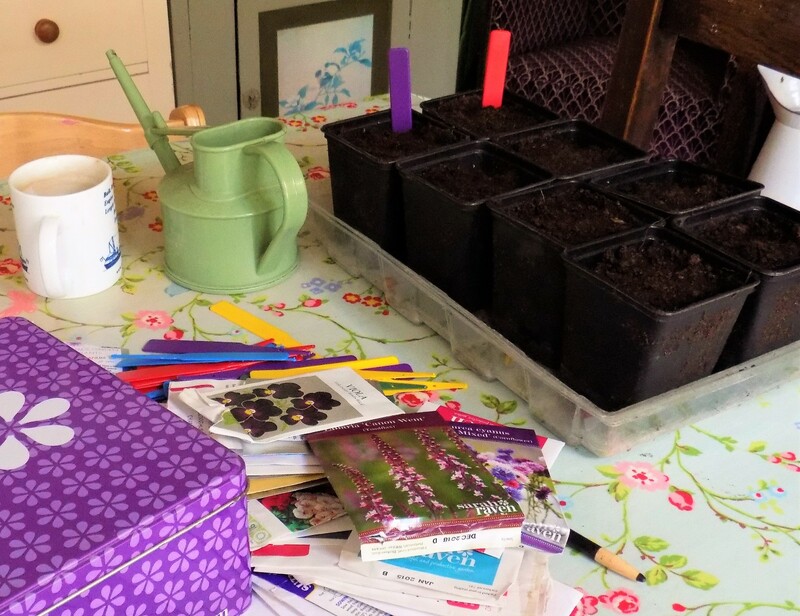 March sees the start of annual seed-sowing and every windowsill in the house will groan under the weight of seed trays and pots. I have a potting shed but it's unheated so I like to start my annuals off inside and then move them out to the potting shed (and eventually the cutting beds) when the weather heats up. This will free up space on the windowsill for a 2nd batch of seedlings. 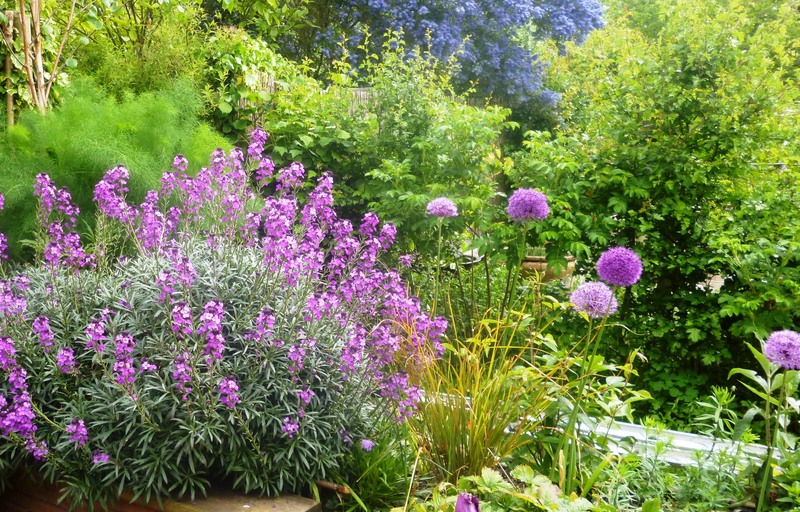 Perennial Wallflowers (Erysimum 'Bowles Mauve') and Alliums. It's not all about annuals though - perennials, shrubs, grasses, herbs and bulbs all have a role to play too. Now is a good time to make plans for introducing new plants into your garden that look good but can also be cut and brought into the house. Seeds are relatively cheap and although seed has to be sown each year, you can allow some flowers to go to seed at the end of the season and store seed to sow the next year, cutting down on your annual seed bill. I love trying new varieties so will always buy new seed each year but I have some stalwarts that I love and will always grow like Cornflower 'Black Ball' & Ammi majus, and I will save the seed from these. Annuals are good for dedicated cutting beds, growing in pots and for plugging any gaps in mixed borders. 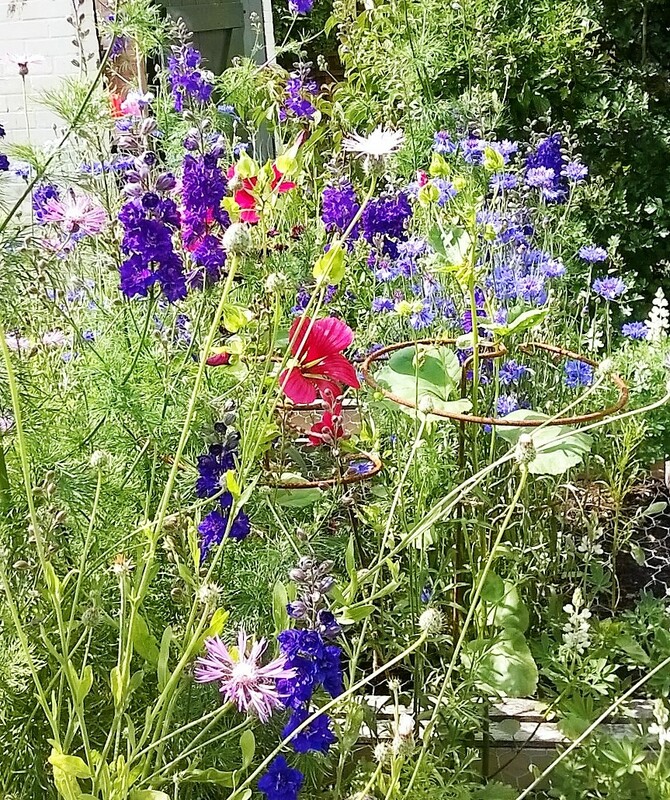 Choose a range of flower shapes and colours and use early flowering hardy annuals (like Cornflowers, Scabious & Candytuft) and later flowering half-hardy annuals (Cosmos, Zinnias and Sunflowers) to prolong flowering time. 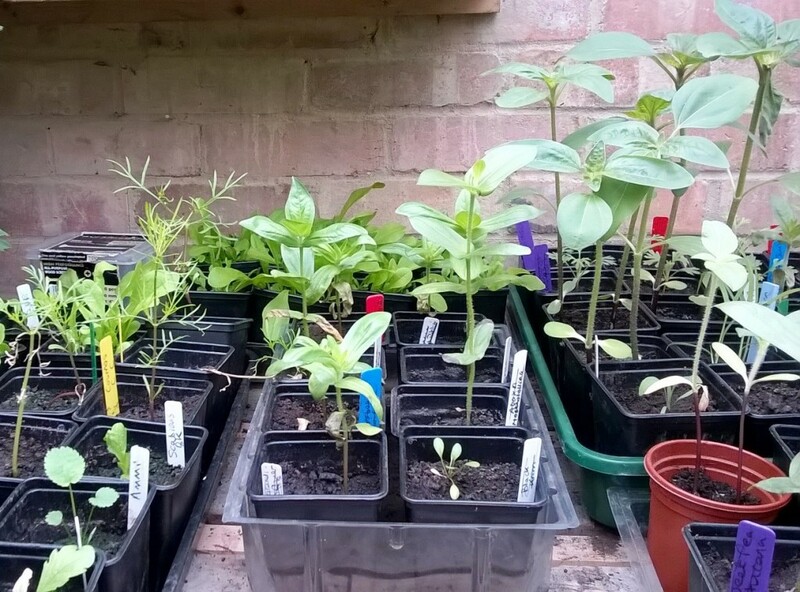 Sowing in small batches throughout the Spring means that you can replace spent plants with new seedlings to continue the succession of flowers. In this way, you can have flowers from annual seed for a good 6 months from say June-October. 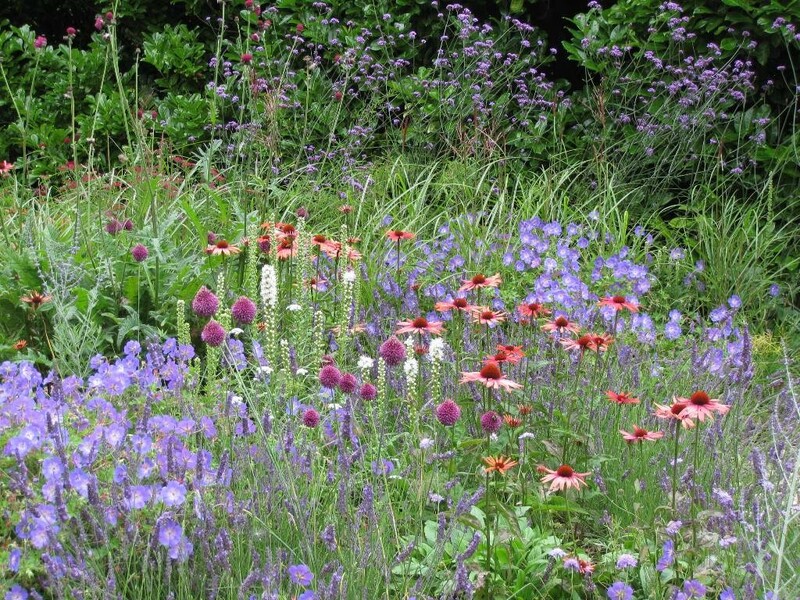 Most gardens have a mix of perennials and shrubs in the garden borders. When thinking about good perennials to grow, go for those that offer a long season of picking. 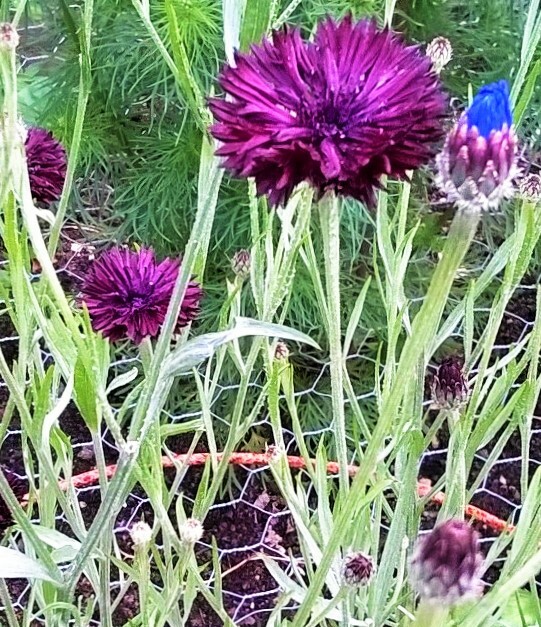 Knautia macedonica, for example, thrives if you keep picking the flowers, producing lots to pick and lots to leave on the plant to look good in the borders. 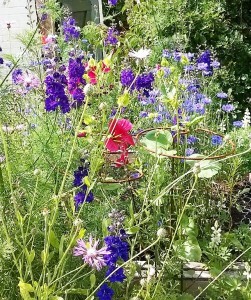 Other good 'cut and come again' perennials include Salvias, Japanese Anemones and Cirsium rivulare. Try to include a range of flowering times from Aquilegia and Delphiniums in early Summer to Sedums, Heleniums and Verbena bonariensis, which flower into Autumn, followed by Hellebores which provide welcome Winter flowers. Bulbs are essential for the cut flower garden as they can be packed into borders and many start flowering in late winter or early spring. Extend the picking season by planting early-, mid- and late-flowering cultivars of bubs. For example, with Daffodils, 'February Gold' reliably flowers in March, while 'Pheasant's Eye' flowers from mid-April and with Tulip varieties, you can choose different varieties that will keep you in flowers from April through to June. Bulbs can be forced by an initial period in cool and dark conditions before being brought indoors to flower from mid-Winter. 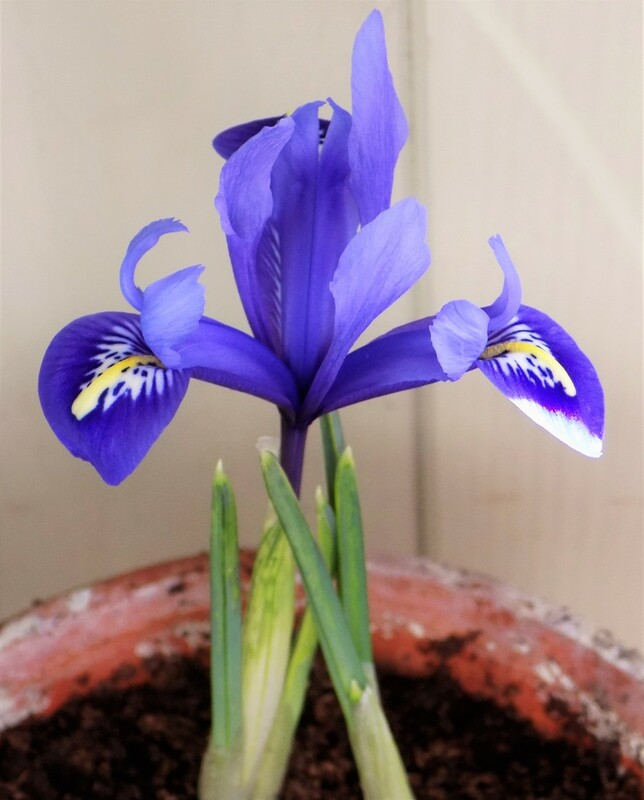 I like to treat Iris reticulata and Hyacinths in this way. Evergreens and early-flowering shrubs such as Japanese quince (Chaenomeles), Witch hazel (Hamamelis), Viburnum tinus, V. bodnantense and Daphne odora can provide invaluable cutting material in Winter and early Spring. Consider planting a mixed hedge in place of a fence to increase opportunities for cutting. Climbers not only provide flowers but some, like Clematis, bear attractive seed heads as well and they can be trained up trees or along walls and fences, taking up vertical space rather than a lot of space in your beds. I have a climbing Rose which flowers on and off over a long period in Summer and into Autumn - I was still picking the flowers into November last year. 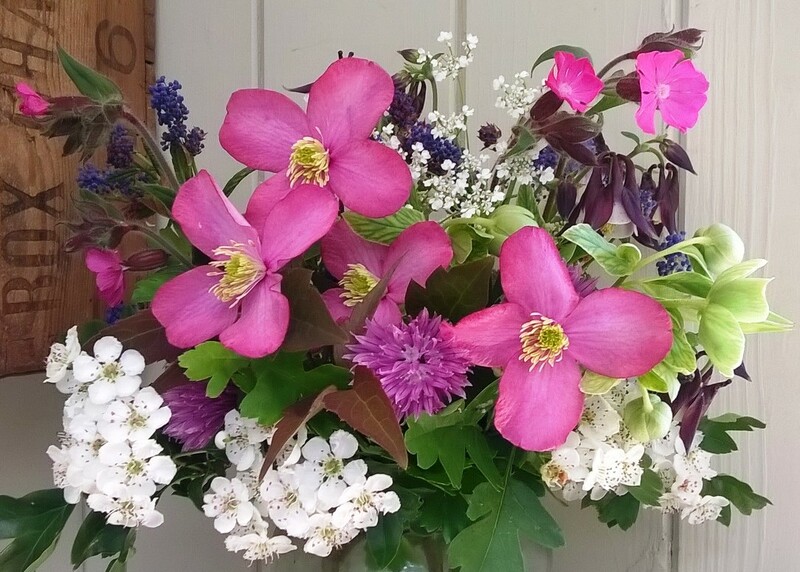 Clematis, Hawthorn, Chive flowers, Aquilegia, Red Campion and Ceanothus - a mix of climbers, hedging, and perennials. It's useful to roughly sketch out your garden, including all available planting space, and noting which plants you will keep which are either useful for cutting or will look good in the garden, or both. You'll then be able to see where you have space to introduce new plants. Using information on eventual height and spread of plants and flowering times, plan where best to place plants. A tool such as the Plant Finder on the Shoot Gardening website can be invaluable when choosing plants as it shows the eventual sizes, season of interest, growing conditions and even monthly care tips if you register for a free trial or subscription. If you need further help when planning your permanent planting, many garden designers offer a planting plan service to plan your beds and borders. Tailored to your individual garden and likes and dislikes, you'll be able to achieve the perfect border for year-round interest both in the garden and in the vase.